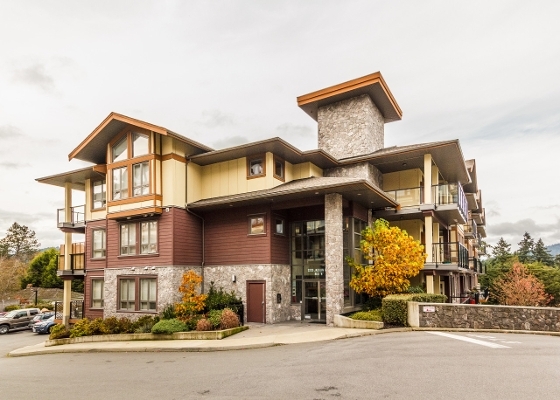 Located in the heart of the Westshore is your large 2BR 2 BA+ den, 1082sqft TOP FLOOR condo. Featuring vaulted ceilings, full sized kitchen with granite counters, island and stainless steel appliances, spacious dining-living combo, gas fireplace, huge windows, large master w/ 4pce ensuite and walk-in closet, spacious balcony for entertaining, and so much more. Bonus indoor pool, fitness center, dog run, water feature and secured underground parking! Lovely mountain views. Located only moments away from Westshore Centre, downtown Langford, great schools, amazing walking trails, parks and much more! Don't miss out! First time on the market since it was built. Call Today!